2. Use fresh lukewarm water with commercial cut flower food added. 3. Strip all leaves below the water level. 4. 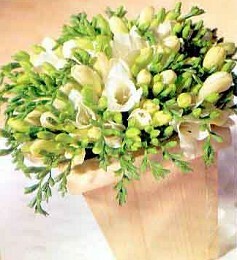 Take at least 3cm (1") off all stems, making a slanted cut with a sharp knife or very sharp scissors. 5. Avoid direct sunlight, heat, or draughts which can shorten flowers' lives. 6. Keep flowers away from fruit and remove faded flowers as they occur. 7. Top up the water regularly and add flower food in proportion.